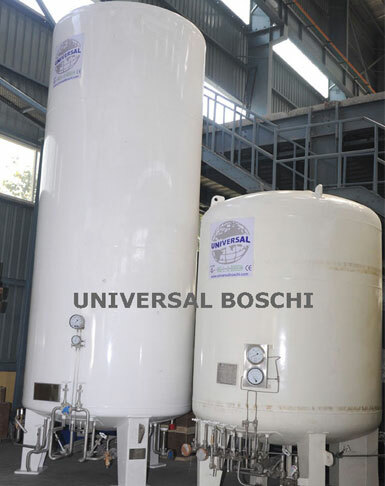 We are leading manufacturers and suppliers of liquid nitrogen plants that are impeccably designed in technical collaboration with ING. L. & A. Boschi, Italy. 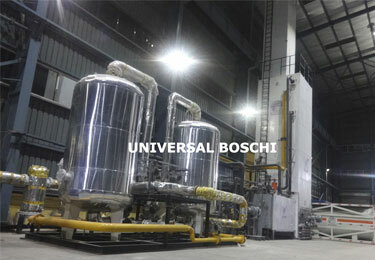 Our liquid nitrogen generators are fabricated using proprietary technology of BOSCHI Italy who have developed and specialize in small, medium & large capacity, high purity Liquid Nitrogen plants .The special advantages are the cross flow trays, cryogenic material of construction and high efficiency heat exchangers due to which we are able to achieve steady flow and high purity production of Liquid Nitrogen. 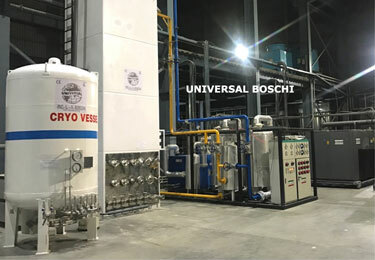 We specialize in making these liquid Nitrogen plants of superior designing and cutting-edge cryogenic technology to achieve purity from 99.9% up to 99.999%, OR part per Million (PPM) as per the application and requirement of the end user. 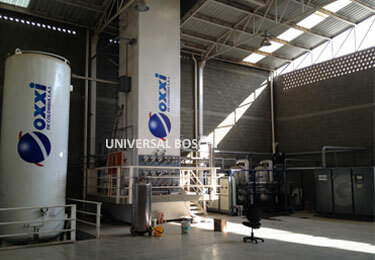 We are offering a wide range of capacities from 10 Liters/Hour to 5000 Liters/Hour Liquid Nitrogen plants. Display Can Be Set In 27 Languages. Automatic Restart after Voltage Failure. Remote Start, Stop, Load, Unload. 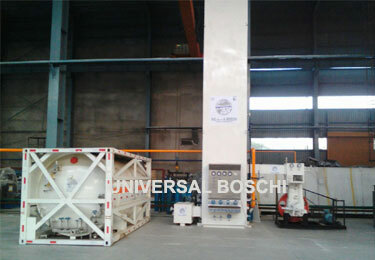 Saver Cycle Control Minimizes Energy Consumption. Compression of atmospheric air : Air is compressed at a very low pressure of 5-7 bar (kg/cm2) using latest Air compressors (screw/centrifugal type). Pre cooling system: It is the 2nd stage of the process and uses a low pressure refrigerant for pre cooling the warm processed air incoming from air compressor to temperatures around 5 to 10deg c before it reaches the purifier. Purification of air by purifier : Air enters a purifier made up of twin molecular sieve driers, functioning alternatively. The sieves separate the carbon dioxide and moisture from the process air before it enters the air separation unit. Cooling of air by expander : Air is cooled below the sub zero temperatures for achieving liquefaction and cryogenic refrigeration. A highly efficient expander is employed to cool air below -165 to -170 temperatures. Separation of liquid air into oxygen and nitrogen by air separation column : Air having been cleaned of hydrocarbons, dust, moisture and carbon dioxide enters into super efficient fin type heat exchanger where the air is cooled below sub zero temperatures by air expansion process in the expander. It becomes liquefied when it enters the air separation column & gets separated into oxygen & nitrogen by the process of rectification. 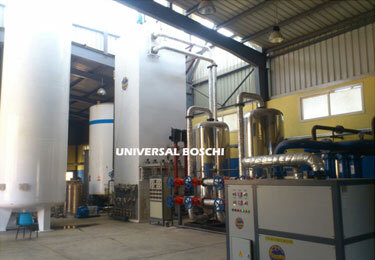 Nitrogen so generated has purity up to 99.9% to 99.9999% as per the requirement of the end user. 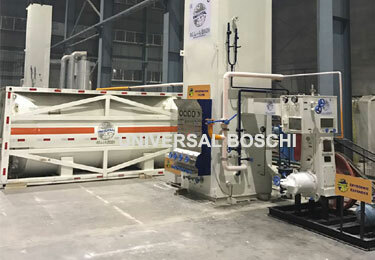 Liquid nitrogen is filled in liquid storage tank : Liquid nitrogen is stored in a vacuum insulated cryogenic storage tank which is connected to the outlet in the air separation column via insulates/vacuum pipe forming a independent unit where no operator attention is needed. Our tonnage liquid nitrogen plant generates liquid nitrogen (LIN) for filling into cryogenic storage tanks. 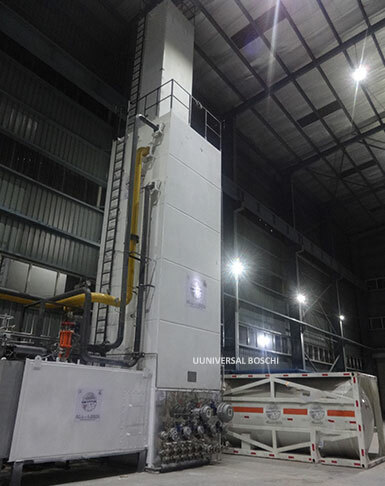 LIN plants uses leak-proof stainless steel column and skid mounted version for high purity medical and industrial applications.